It is a goal of mine to pursue and review apps that will enhance my life and work as a piano teacher, pianist, organist and blogger. Recently, I was looking for a “slow downer app” and my quest took me to Anytune. Here’s a brief and fast-moving clip highlighting its features. This app will be invaluable to me as a pianist and a teacher of those who enjoy playing pop music. Many times sheet music is not available or the arrangement is not as close to the original as a pianist would like. 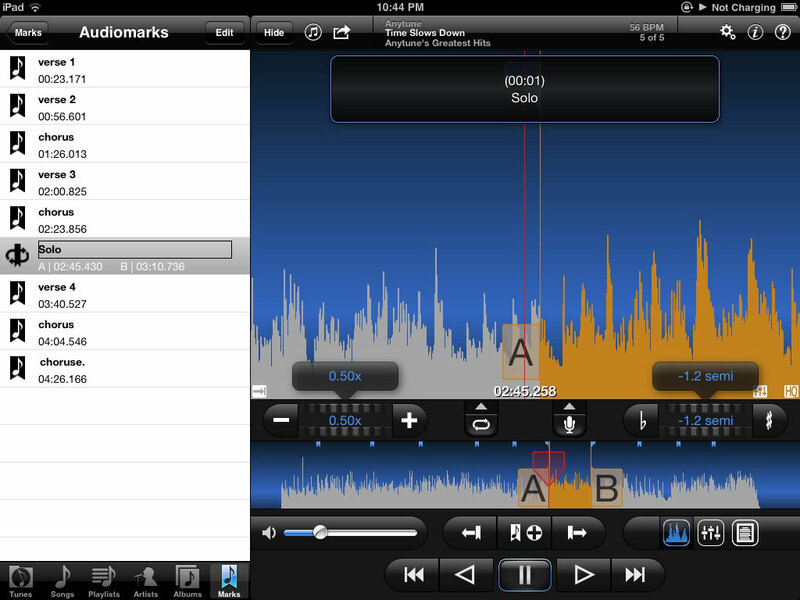 This app slows down any tune in your iTunes library–just one of the many favorite features of this app. Instead of describing how Anytune works, here’s a video of me showing how I plan to use this. By the way, the app also can change the pitch of any tune–I explain how I plan to implement that feature as well. My video demonstrates my relative ease with navigating through the app’s features. If I can do it, you can too! FYI: After the video was posted, I discovered that this works well in landscape mode very nicely, and you can double tap the slider to return to the starting values such as the original tempo and pitch. This is a purely personal scale that reflects how I see this app enhancing my daily life and work. Hopefully this rating may aid you in your future app purchases. Total Score: 12/15–definitely worth your consideration, my students are thrilled. PLUS, this app holds a huge coolness factor! Before the video was even over, I had three students in mind who would love this. I’d love to use this for myself to learn jazz/gospel too! Looks like a great app. Hi Lauren, Glad to hear you and your students can benefit from this app. Would love to hear how it works for you. Thanks for the great demo video! Which version did you purchase? Trying to decide between the Pro and Pro HQ. I generally get the top of the line app as I figure it I might “want it all” at some point. The price difference isn’t that huge. Thanks for checking out the video, it truly is a “power tool” app. Great app – I’ve just loaded the free version but think I’ll have to upgrade.